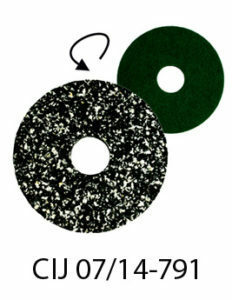 The new generation of polyurethane pads for maintenance cleaning. The new pad is an innovative development extension of conventional cleaning pads. Due to the composition of polyther and polyester the pad is very tough and unbreakable. It is used for the maintenance cleaning of any hard floor coverings such as tiles, stone floors, porcelain stoneware, concrete floors, vinyl floors, PVC and linoleum. It is especially suitable for the use in public facilities, airports, shopping malls, hotels, restaurants and office buildings. Use the pad side for cleaning all hard floor surfaces.